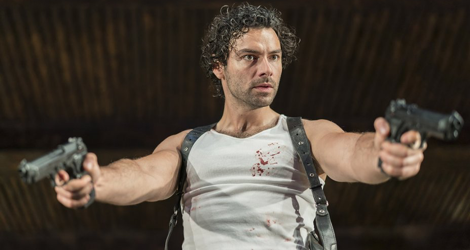 Many people at the recent preview I attended of Martin McDonagh’s brutal black comedy The Lieutenant of Inishmore were there to see Aidan Turner, the brooding Irish hunk who plays the title character in the ITV series Poldark. They might not have been prepared for what is one of the goriest comedies written since Jacobean times featuring multiple killings, torture, blinding and dismemberment that leaves the stage awash in blood. As for Turner they were not disappointed. He’s as charismatic a performer on stage as he is on screen. And the precisely timed direction of Michael Grandage has you laughing at the horrific events on stage in a way you never would do in real life. McDonagh’s play, a satire on terrorism, was given its premiere by the RSC in Stratford-upon-Avon in May 2001 in what now seem like days of peace before the terrorist attacks of 9/11 four months later. The fact that Grandage feels we can laugh about terrorism again, shows how we have moved on and come to realize the ultimate futility of the enterprise, despite all the lives lost. This is exactly the point of McDonagh’s satire. The play is basically a finely tuned farce except that instead of slamming doors, the characters have to cope with blazing guns. 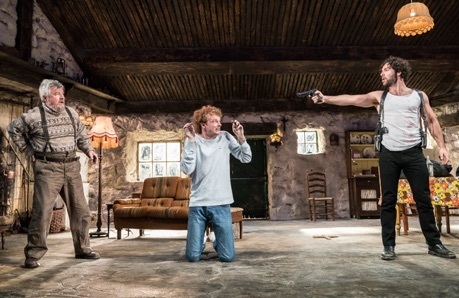 The play is set on the island of Inishmore, County Galway, in 1993 when the peace process between the British and the IRA is just beginning. Padraic (Aidan Turner), known as Mad Padraic, was considered too violent and out of control by the IRA and not allowed to join. Instead, Padraic joined the splinter group, the INLA (Irish National Liberation Army), but Padraic considers even that group too soft and wants to form his own splinter group. Padraic has a basically violent temperament and takes it out by killing drug pushers and blowing up chip shops while convincing himself that this is somehow for the benefit of a free Ireland. All of this we discover in the hilarious first scene of the play in a panicked conversation in Inishmore, Padraic’s home town, between Padraic’s father Donny (Denis Conway) and his long-haired, teenaged neighbour Davey (Chris Walley). The two have a major problem on their hands. Davey has found a black cat dead on the road and brought it to Donny. The cat has had its brains knocked out and Donny accuses Davey of having ridden over it on his mother’s bicycle. Davey strongly denies this. The problem is that the Donny believes the cat must be Padraic’s black cat Wee Thomas, who has been Padraic’s for more than 15 years and whom Padraic loves more than anything in the world. Padraic left Wee Thomas in Donny’s care and if he hears what happened he’ll come back to kill both of them. The two concoct a plan to let Padraic down easy and phone him in Belfast to say that Wee Thomas is feeling poorly and gradually lead up to announcing his death. The plan immediately goes awry, however, because when Padraic hears of wee Thomas’s decline in health, he stops everything he’s doing – which happens to be torturing a drug dealer (Brian Martin) – and heads home. This leaves three types of people waiting in Inishmore for Padraic’s return. There is Davey and Donny vainly trying to turn an orange cat black with shoe polish and hoping to pass it off as Wee Thomas. There is Davey’s 16-year-old sister Mairead (Charlie Murphy), in love with Padraic, who has been blinding cattle with her air-rifle as a form of personal terrorism against the meat industry. And there is the one-eyed Christy (Will Irvine), who with his inept colleagues (Julian Moore-Cook and Daryl McCormack), is planning to assassinate Padraic on behalf of the INLA for not going after his assigned targets. The surprise for most people who have not seen Aidan Turner on stage before is what a natural stage presence he has. If he comes across as intense on screen, he comes across as just as intense on stage. He gives Padraic the same driven nature as that of Ross Poldark in the television series, except that that forcefulness, elicited as it is by a cat, is mocked. Turner is fully adept at playing obsession for comedy. One of Turner’s best moments is when he is preparing himself to assassinate Davey and his own father for murdering Wee Thomas yet is so overcome with grief for the cat that he wavers between rage and incapacitating sorrow. Will Irvine is suitably menacing as Padraic’s IRA nemesis Christy and Daryl McCormack and Julian Moore-Cook dead funny as his comic Northern Irish comrades who frequently get entangled in debates about word usage. Charlie Murphy plays Mairead as young woman as intense and perhaps even more fanatical than Padraic, a man she has idolized since youth. Christopher Oram has designed a typical Irish stage cottage, humorous in itself in that it is so large as to fill the entire stage. Oram mitigate the gruesomeness of the play by creating an obviously fake Wee Thomas with its crushed-in head and later by making various body parts realistic enough to suggest what they represent but artificial-looking enough not to be utterly revolting. This has the great virtue of making us focus on the actions that the characters perform rather than on the grim results of their actions. Obviously, no fan of Aiden Turner will want to miss the chance to see him on stage. While Inishmore is the opposite of a lush romance, you won’t fail to be caught up in the charisma that Turner exudes in person and his talent for comedy that was absent from the stories he’s previously been asked to play. McDonagh’s play may be as gory as it is comic but in its satire of the purposelessness and ultimate ineffectuality of terrorism seems even more relevant today that it did in 2001. Photos: (from top) Aidan Turner as Padraic; Dennis Conway as Donny, Chris Walley as Davey and Aidan Turner as Padraic. ©2018 Johan Persson.